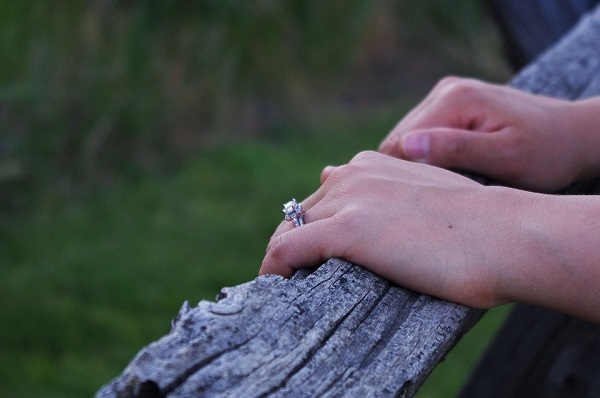 If you have been wondering how to add more romance and sentimentality to engagement rings, understanding the deep symbolism behind many of the styles, stones and practices can be a great way to find inspiration. The very first diamond engagement ring in history is thought to have been given by Archduke Maximillian in 1477, when he presented a ring to his beloved, Mary of Burgundy. Before that, rings were generally simple metal bands. Commoners wore iron, while royalty wore gold and silver bands to symbolise wedded bliss. Inexpensive stones were sometimes used, but diamonds were nowhere near as popular as they are today. In earlier times, this ring represented a part of the bride's dowry. The ring indicated that a women was betrothed, and the quality of the ring indicated her groom's social standing and wealth. Today, of course, the ring has far greater symbolism – regardless of the status of the groom or the bride. Diamonds are used along with a variety of other stones and metals, with more choice in ring styles than ever before. What Does Your Engagement Ring Say About Your Love? What exactly do engagement rings symbolise, and why are they worn on the left finger? According to common belief, it was the ancient Romans that began the tradition of placing the ring on the finger of the left hand. This is because they believed the 'vena amoris' (vein of love) to be found on this finger, which connected to the heart. Diamond. The word diamond hails from the Greek word adamas, meaning 'the unconquerable'. This is rather apt, considering that diamonds are one of the strongest substances on earth. This stone represents incredible strength. Ancient Greeks believed that diamonds were the splinters of stars that had fallen from the sky, thinking that they had all the power and protection of the skies above. In India, the stones were believed to provide a shield against evil. Early astrologers thought that diamonds promoted endless love while warding off evil. All over the world, this stone has plenty of lore and legend, making it a fitting stone for such an important item of jewellery. Circles. In Celtic lore and many other legends, circles have special symbolism. The circle has no end and no beginning, making it a perfect representation of eternity. Circles represent renewal, wholeness, perfection and sacred geometry. They symbolise the sun, moon and the planets. Whether adorned with beautiful stones or kept symbol, the ring itself is a powerful symbol for love and unity. Three Stone Rings. A popular style for engagement jewellery is the three stone ring. These rings feature a centre stone flanked by two stones that are usually smaller in size. Each stone represents a different phase in a relationship. The centre stone represents the present, while each of the two stones alongside it represent the future and the past. These rings range from classic styles all the way to contemporary styles, with round, emerald and princess cut stones used. Engraving. While not symbolic on its own, engraved rings can be a great way to add your own personal symbolism to your ring. A message that only the two of you understand, the year you first met, a declaration or promise of your love, a nickname, a line from a poem or any other bit of text can add great significance to a ring. Birthstones. Every precious stone has its own story and symbolism. For a full breakdown of the symbolism in stones, read our blog post on what precious stones symbolise in engagement rings. Birthstones can be a lovely way to represent special dates in your relationship, such as the date you first met, the date of your first kiss or your first date, or even the date of your wedding. As an added bonus, thinking out of the box can help you design an unusual ring that is 100% unique. Infinity Sign. In Celtic lore, this sign is called a lemniscate. The figure eight shaped symbol has a long history dating back to a formal description in 1694 by Jacob Bernoulli. Even before that however, the shape has appear in ancient Tibetan art as well as numerous other cultures. The shape looks like the number eight, representing the joining of two halves. As the shape features its own reflection, it has become the ideal symbol for unity, togetherness and enternity. If you would like professional help designing your dream ring, contact Cape Diamonds today for a consultation. We will help you create the perfect choice of engagement rings that has all the symbolism you could ever want to make it truly one of a kind.